There’s always plenty to see at a stadium. Fans come for the events, of course, but bright lights, delicious food and loud music also compete for attention. With all the fun and games, how can you be sure your signs get noticed? At Bartush, we love working with stadiums and sports arenas despite the challenges. With our background in custom work, our designs stand out and send a message, even in an environment full of distractions. From the dugout to the outfield, the press box to vendor areas, you have a wealth of opportunities to brand, and you’ve got plenty of real estate to offer sponsors. Whether you need help thinking outside the box, or you have an idea you want brought to life, we’ll make the most of your space and keep it looking fun, exciting and modern. If you have no idea where to start, we can help with that too. We offer a huge variety of sign types and services, and we’re happy to provide consultations. 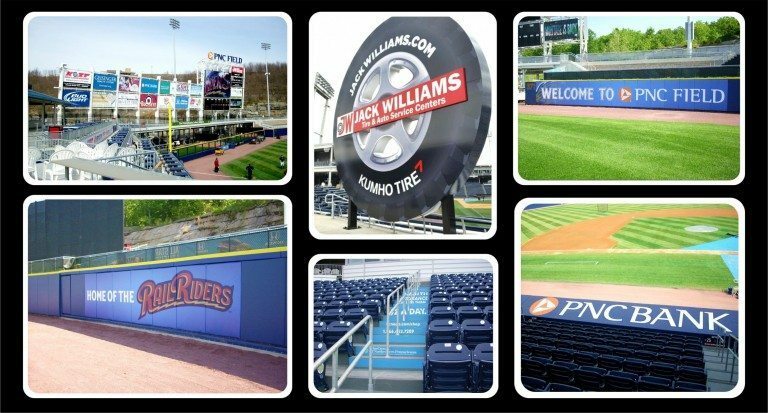 Outdoor, indoor, standard, digital…Sports arenas and stadiums can benefit from employing a combination of signs, and we’re fully equipped to guide you to the right decisions. Check out our gallery below, and be sure to contact us today to discover your options!